A peaceful place in Friðland að fjallabaki (Fjallabak nature reserve) to visit for long and short time. It is especially suitable for families, special groups and in fact for everyone who wants to enjoy the peaceful and mystic mountains. There are many interesting and magnificent places in the area, for example, mount Hekla, Krakatindur, Landmannalaugar, Valagjá, and the ice caves in Reykjadalir and Hrafntinnusker. Landmannahellir (Gps N 64 03 V 19 14 )is easily accessible for those on riding tours in the mountains, and there are good facilities for horses and tourists. Here you can see a picture of the houses in Landmannahelli from a camera which is located on Löngusátu nearby Landmannahelli. There are 3 horse fences, a stable for 40 horses and enough hay. Sleeping bag accommodation is in eight different nice cottages for 92 guests in comfortable single and double bunks. The cottages are well heated, with running water, cooking facilities and WC. 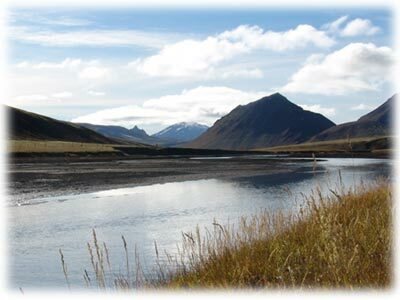 At Landmannahellir there is a nice camping site and a site for house vans, camping wagons, a lavatory, an outdoor grill, and possibilities to go trout angling in the magnificent neighbouring lakes. The tourist service and accommodation centre is open from middle of June to early September.